With three days left in Israel and only one in Jerusalem, mum and I set about exploring. 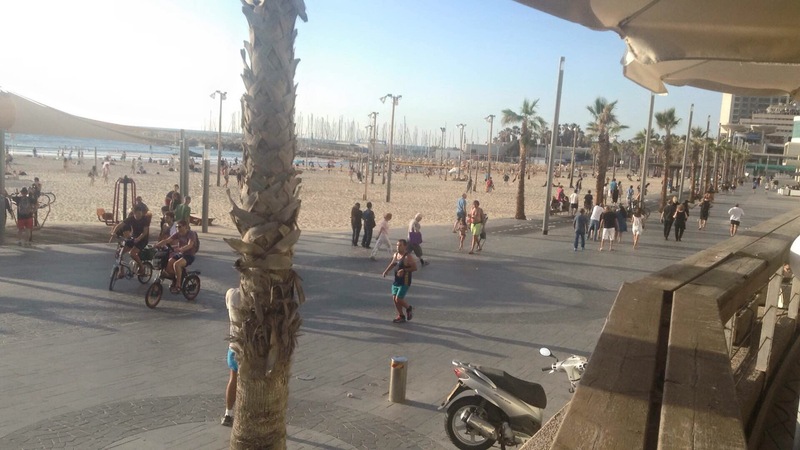 We walked down Jaffa road where we made our first stop at a coffee shop perched in the sun. We were intently discussing the significance of the sites we hoped to see when a strange man in sunglasses, cap and a blue t shirt approached us rather briskly and said, “Nichola love, fancy seeing you here..” This strange man has made one blog appearance before, Mr Jupp, mums husband of one month. He had flown out to Israel the day before and made his way to Jerusalem to surprise us. Our reactions were both of equal shock, mum speechless with silent tears, me in disbelieving laughter. As we sat there enjoying our coffee the disbelief continued, it was surreal to see him sitting there. We entered the old city through Jaffa gate once more. With a slight idea of the layout of this historic jumble, we headed for Church of the Holy Sceptlecre. 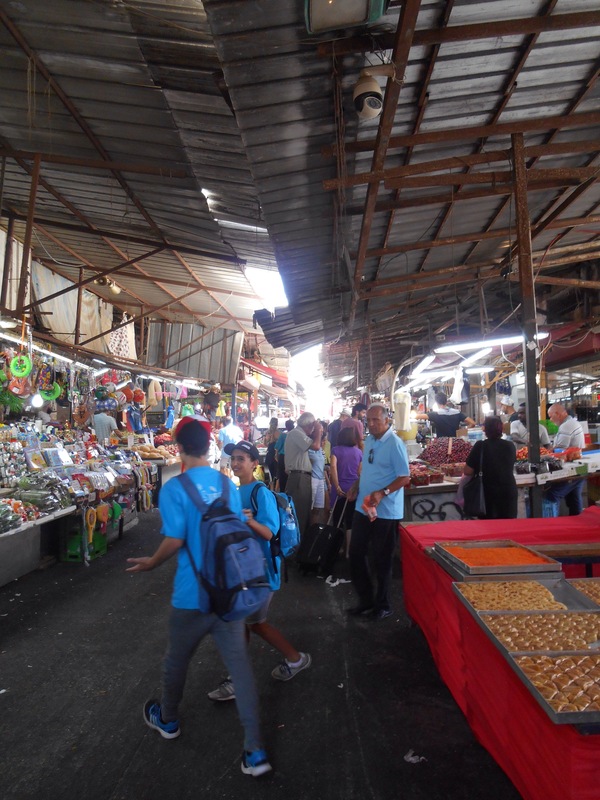 Ian lived in Jerusalem for seven years and confidentially steered us through the market stalls and winding routes to reach the church. 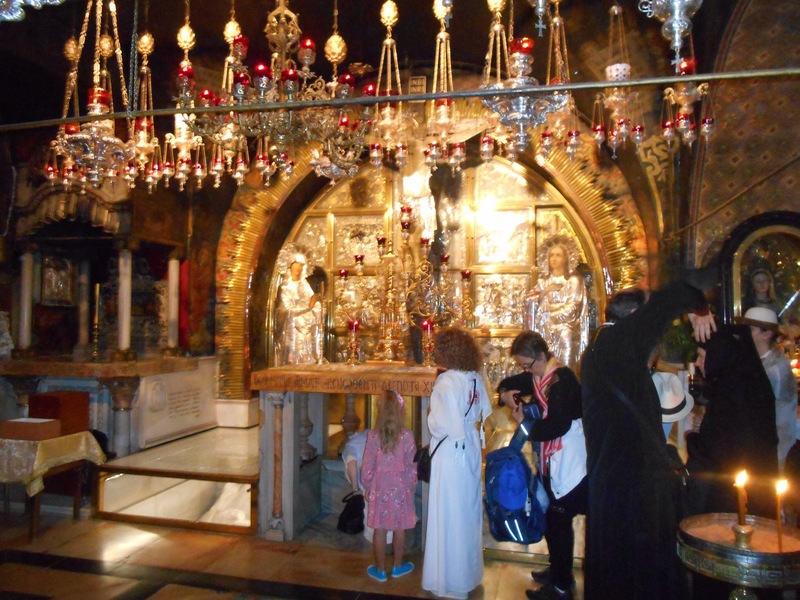 For Christians this may be the most holy site in the world, the site where Jesus was crucified. Of course, a Christian site does not mean it is simple. 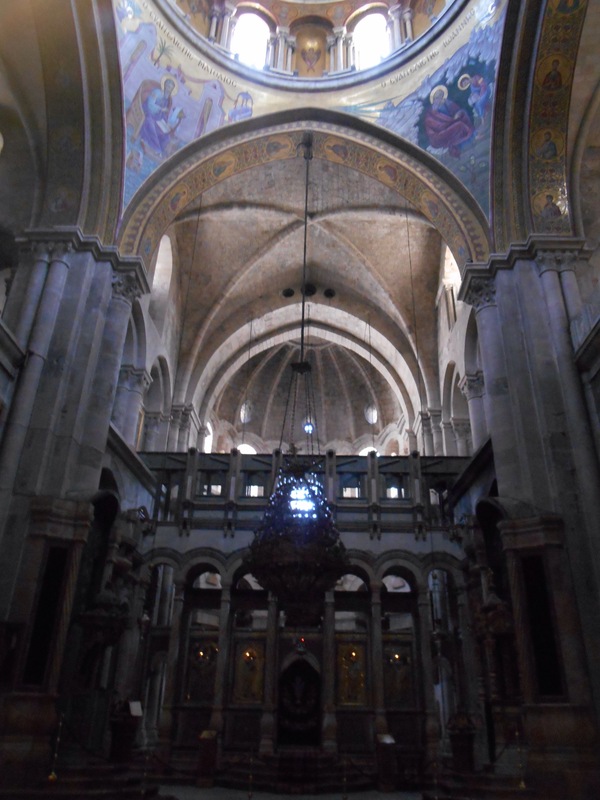 Within the church, 5 different denominations lay claim, including Greek Orthodox, Russian orthodox, Franciscan and it is not unheard of for physical violence to occur between monks. In fact nothing can be changed unless it is agreed on by all groups so small details signify the huge divide. There is a ladder on the second floor window which has several stories surrounding it, some say it was left there by workmen but no one knows who was responsible for moving it. 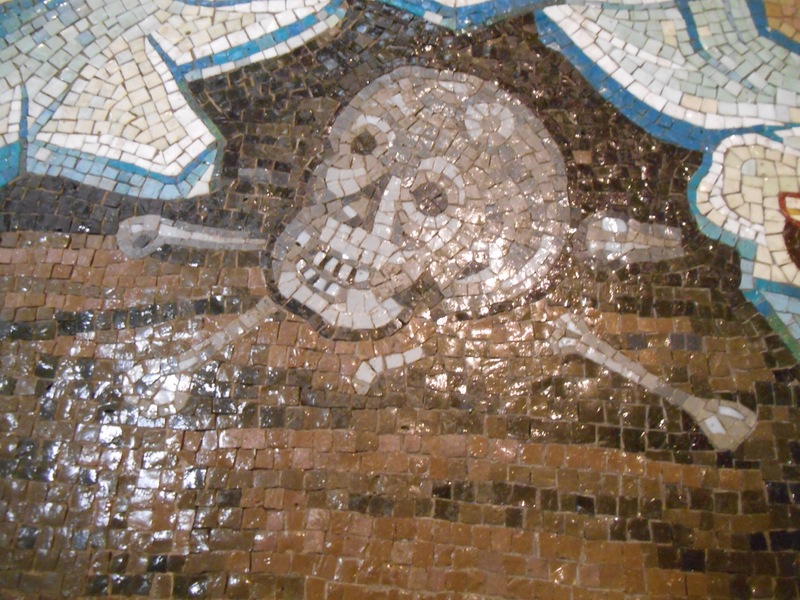 Some say it was used to provide food to Christians trapped inside during a Muslim siege. Either way, no one has the authority to move it so it must remain. A Jordanian Muslim family has the keys to the church and must open it and lock it up each day. Inside it is like 10 churches in one, maybe more. Each denomination has its own section decorated in a different way. On one side the normative style arches may be plain when the next arch may be lavishly mosaicked with gold and sparkle. Some depict scenes from the bible with pictures, others statues, others symbols. 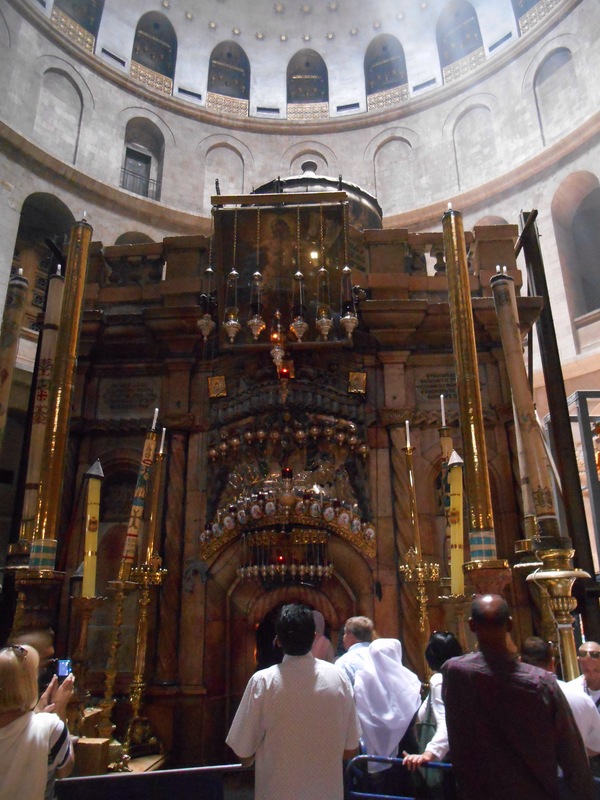 Nonetheless it is a place of pilgrimage and many drop to their knees to see the site where the crucifix stood, the site where Jesus body was lain and suggested site of his tomb during his three days lain dead. It certainly is a significant site in Jerusalem and aptly demonstrates how important this city is to so many religions, creeds and denominations. 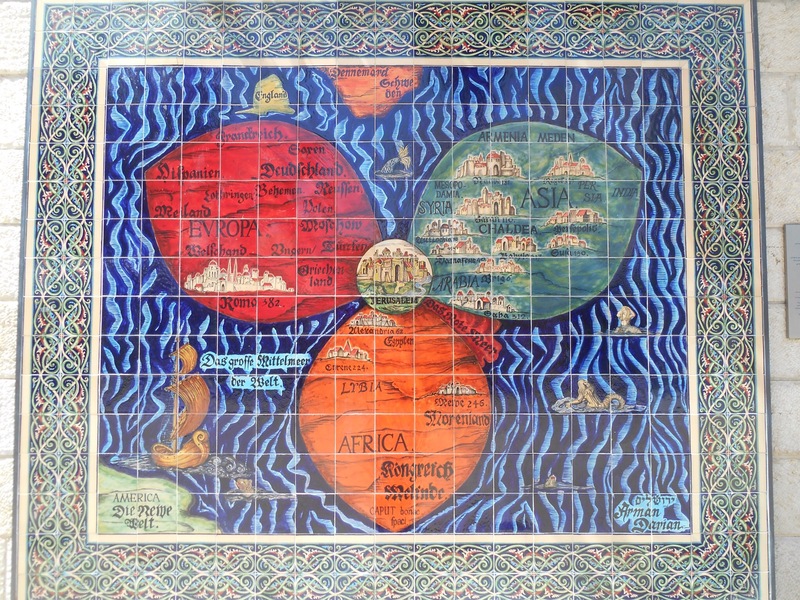 The Bunting map from 1581 shows Jerusalem as the centre of the world. Another site I was keen to see up close is the western wall. 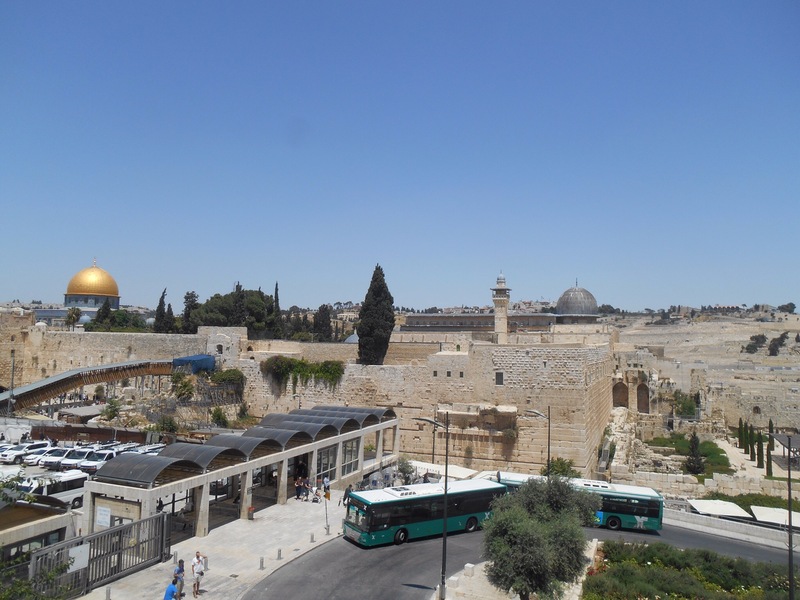 This is significant for Jewish people as the only remaining wall of the second temple which Herod built, a temple where Jesus would have worshiped and an important site of sacrifice. As the temple was destroyed this is holiest place Jews are able to pray, the holiest site lying beyond the wall. For this reason, it is also known as the wailing wall, with the temple destroyed it prevents them from offering sacrifice. The wall is split into a male and female area and you have to approach the wall, covered, not turning your back on it. Men and women lay their hands on the wall, praying and expressing emotions, tucking notes and prayers into the brickwork. Once they are done they back away and many more seek their space. It was an emotive experience to see how much this meant to so many. We ate a simple falafel lunch and then quickly returned to the hostel, keen to make our way out of Jerusalem before Shabbat shut everything down for 24 hours. 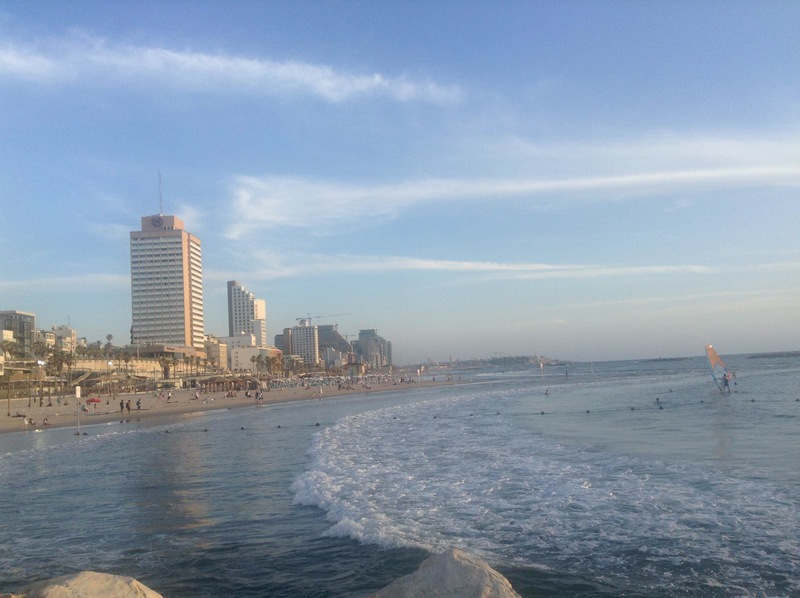 We were heading to Tel Aviv, where as a cosmopolitan city is much more secular. The saying goes Tel Aviv plays whilst Jerusalem prays. 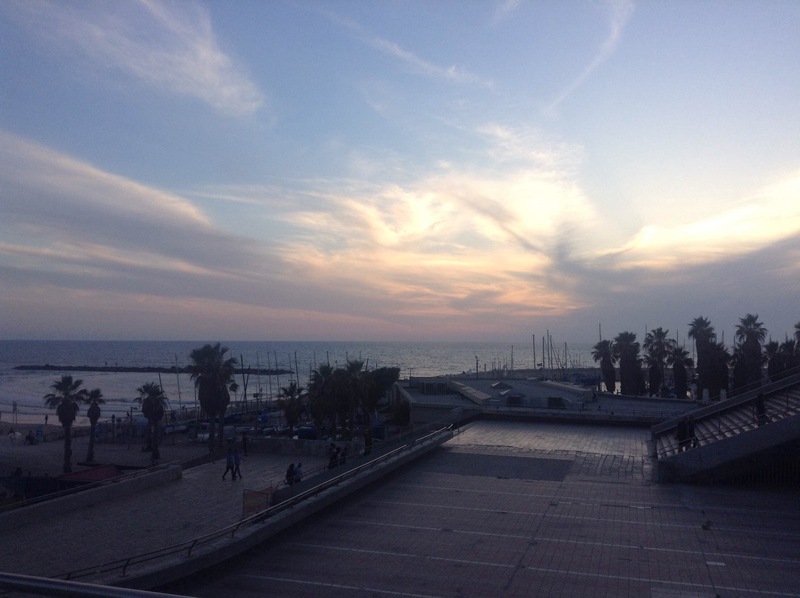 Our hotel in Tel Aviv was on the beach front, an amazing view over the beach. With the change of circumstances, I was to now have a room to myself and a nice balcony facing north overlooking the marina. It was far fancier than anywhere I have stayed before but without my favourite spot in Israel to relax, the rooftop of my Jerusalem hostel I hosted 1 person dance parties infront of the large mirror by playing the music channel as loud as I dared. We made the most of our great location drinking coffee on the waterfront and people watching as everyone ran, boarded and skated past, many using the open air gym, surfing, paddle boarding and just parading along the coastline. Here was a vastly different side to Israel, one that was not unfamiliar to america or Europe. Later on in the evening after a meal, I met Kosta and Marius on the beach to enjoy the cool evening air and while away the final few hours before Marius’ early morning flight. With the end in sight of the Israel trip it was time to get some colour to prove it. The beaches were full with people tanning, swimming, playing bat and ball, surfing, running and relaxing. 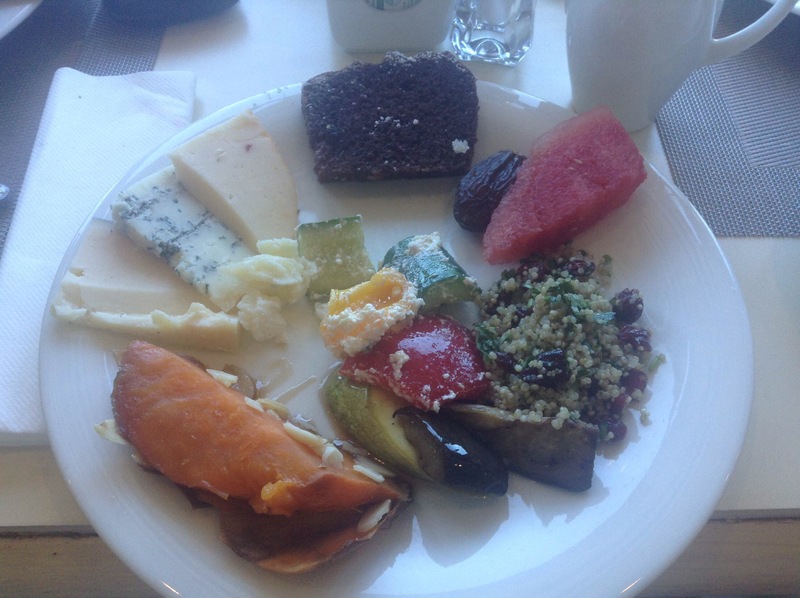 This was Shabbat in the city, a more liberal approach to the day of rest. In the evening we walked along the beachfront stopping for more (unnecessary) food and the final tastes of Israeli beer in a far from Israeli setting, an Irish bar. 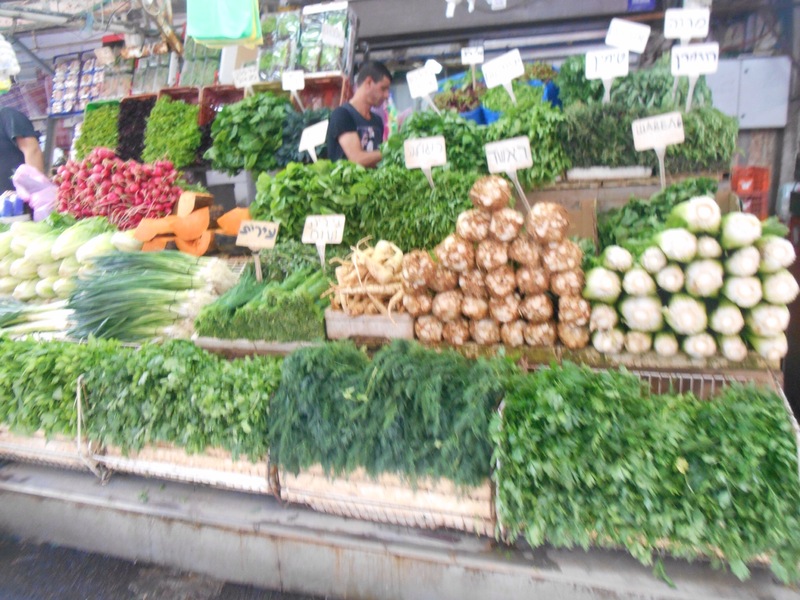 The next morning we made for Ha Carmel Soq, a market in the centre of hot Tel Aviv. The usual trinkets were for sale, decorative Hamsa’s, jewellery adorned with the Star of David, fresh fruit smoothies, figs and delights. The colours and smells continued to distract you from the heat. 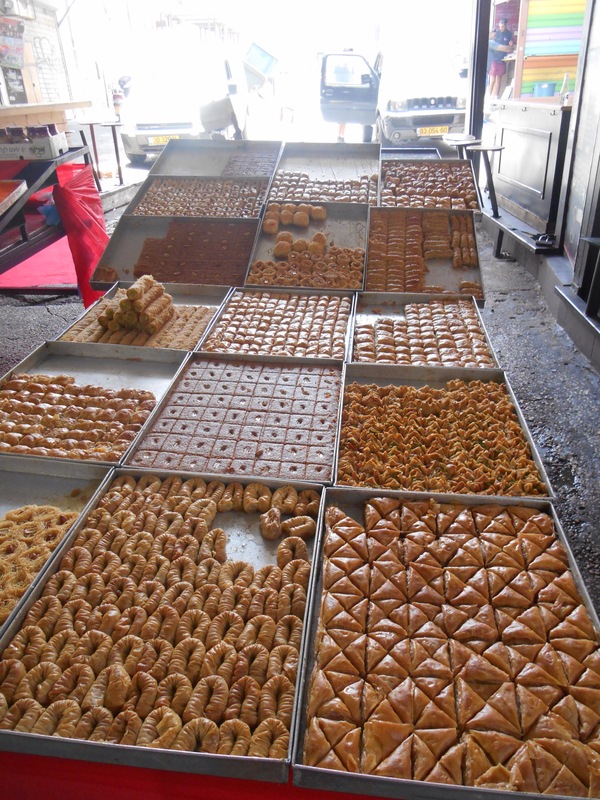 We continued along the boardwalk to Jaffa to continue our sensory experience through the eclectic streets of the market town, making the most of our last few hours on middle eastern soil. We all made for the airport together for our evening flights. Israeli security is notoriously tough and I had to be interviewed before check in as they examined each individual passport stamp and asked “why have you been back to Indonesia?” “What did you want with turkey?” Having passed the questioning your bag is carefully rooted through, analysed and you have to convince several more checkpoints that you are not suspicious before you can board your flight. With another incredible adventure drawing to an end, another few countries etched on my heart, it was UK bound for a change of attire ready for Iceland.